Available for only £45 and No re-test charges! 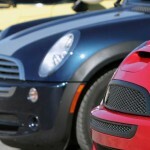 Our MOT garage on site provides the MOT your Mini deserves. With the added benefit that should your car fail, we are also able to repair it for you to get you on the road as quick as possible. No work will ever be carried out without your explicit say so. We will advise you and talk through any issues that prevented an MOT pass and if you wish we can show you any issues first hand. Don’t get caught out with MOT retest charges. The MOT garage doesn’t charge for retests so the MOT fee you pay is all you pay. Some MOT garages can and do charge for a re-test, if you are getting an MOT elsewhere, check beforehand to ensure you won’t pay twice. If you are having an MOT done the same time as a service (Inspection I or II) then we can offer the MOT at £35, saving a further £10. Mini owners now have the opportunity to repair and service their vehicle at alternative workshops to the automobile manufacturers and not in-validate their warrenty. This gives you the freedom to choose the workshop of your choice to have your Mini repaired and serviced, giving you freedom and better value for money, see you soon!